Scottish Cyclocross Association: Cyclocross Returns to the North East! Cyclocross Returns to the North East! After a long absence, cyclocross racing will return to North East Scotland with an exciting new event at Knockburn Loch, near Banchory, on 8th November. The course will be around 2km long with sections of forest track, singletrack, tarmac, sand(! ), short steep climbs and maybe hurdles. 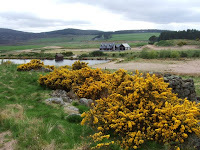 It follows the outside of the Knockburn Loch then surrounding land, and most of it is visible from the start/finish area. A link to course map will be posted once finalised. Toilets, changing rooms and hot showers are available on-site. Entry fees are £8 adults, £4 youths - plus £2 day licence if required. Under 12s race for free. Entry on the day only due to the short notice, but please e-mail organisers at aberdeencx@yahoo.co.uk if you intend to race to give them an indication of numbers. To give some background to the location, Knockburn Loch is man-made and was created seven years ago by a local entrepreneur as a free-for-all sporting facility. It has been successfully used for open water triathlons and off-road duathlons. Knockburn Loch is located approximately three miles south of Banchory. SatNav users can find the event using the postcode AB31 6LL or click here for a map. Will this event be considered part of the series? Or is it more a taster for good things to come? Knockburn isn't a round of the SCX series this year, but it sounds like a cracking race course and venue so could well be in for 2010. Thanks for a GREAT event! Well organised, beautiful location, great support from the marshals and the MC how encouraged all the CXers young and not so young! My first muddy race ever. A great day out. Very hard on the legs compared to road biking and running. Big thanks to all involved in making it happen, and especially to Jammy and his PA system who made all us newbies feel very welcome. Very good location, good course, excellent organisation. I enjoyed helping. Hope this develops into a series. More please!